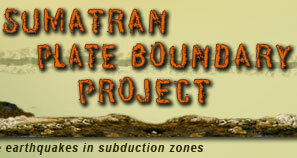 An important aspect of the Sumatran Plate Boundary Project is our interaction with the outside world. That diverse world includes the people of western Sumatra, officials at various levels of the Indonesian and U.S. governments, and students and teachers outside Caltech. This page is an introduction to information that we hope will be interesting and useful to that wide range of individuals. Currently, our educational outreach efforts focus on distributing posters, brochures and GPS station data sheets to people living on the Mentawai and Batu islands during our field sessions, beginning in July 2004. These materials explain why many of the islands are slowly sinking, in the decades between large earthquakes and also why the islands suddenly spring up during the infrequent large earthquakes. Furthermore, the materials explain the purpose of our GPS stations, present the data, and give some suggestions of how to limit damage and losses during future earthquakes and tsunamis. Sumatra's series of five tremblers doesn't look good, says Professor Kerry Sieh. "...historical records, seismic monitoring by global positioning sensors and a careful study of growth patterns of corals converged in a remarkably precise prediction of a major earthquake and tsunami here within the next 30 years." Indonesia's major earthquake last year tilted Nias Island like a seesaw, disrupting villagers' lives and pointing to future dangers. To Singaporean government officials, April 1, 2003. To the villagers of Silabu, south Pagai island, August 2004. Our first educational posters and brochures, June 4,2004. 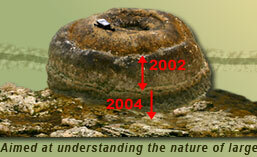 Summarizing Sumatran results as of 2002 to scientists involved in the study of subduction in the US Pacific Northwest. March 11 2005 Caltech Discovery Weekend presentation. This research has been supported in large part by NSF Grants EAR-9628301, EAR-9804732, EAR-9804970, EAR-9903301, and EAR-0208508. Our initial explorations of the possibilities in Sumatra were bank-rolled by a generous, spontaneous gift from the several members of the Caltech Associates.